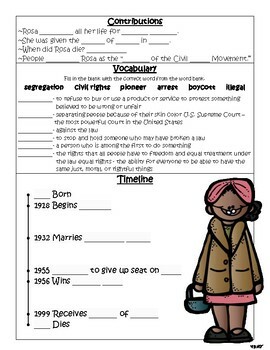 Is your class learning about Rosa Parks? This is a great resource to use when researching facts about her. This can be completed as a whole group activity, with cooperative learning groups, or as an independent activity. This activity is also perfect for adding technology into your curriculum. 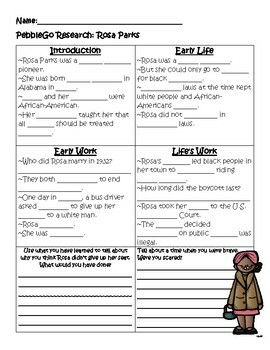 This is a research graphic organizer that is meant to be used with PebbleGo. You need a paid subscription to access this website however, it does offer a free trial. It's an amazing resource to develop and enhance learning. Other PebbleGo research projects are available in my store. "Follow Me" for new products and product updates. Check out the other products in my store too and thanks for looking!